Night Raider Scanning LED Tailgate Bar 60"
Night Raider Scanning LED Tailgate Bar 48"
Night Raider Scanning LED Tailgate Bar 36"
We've all seen the way that the car in the hit TV series Night Rider shows off its scanning lights.. Now bring that custom look to your truck! 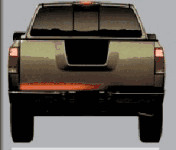 The Night Raider Scanning Tailgate bar installs below your tailgate to offer increased visibility for better safety, as well as a cool custom look that is going to turn heads! Available in 36" 48" or 60", there is a size to accommodate almost every truck out there!